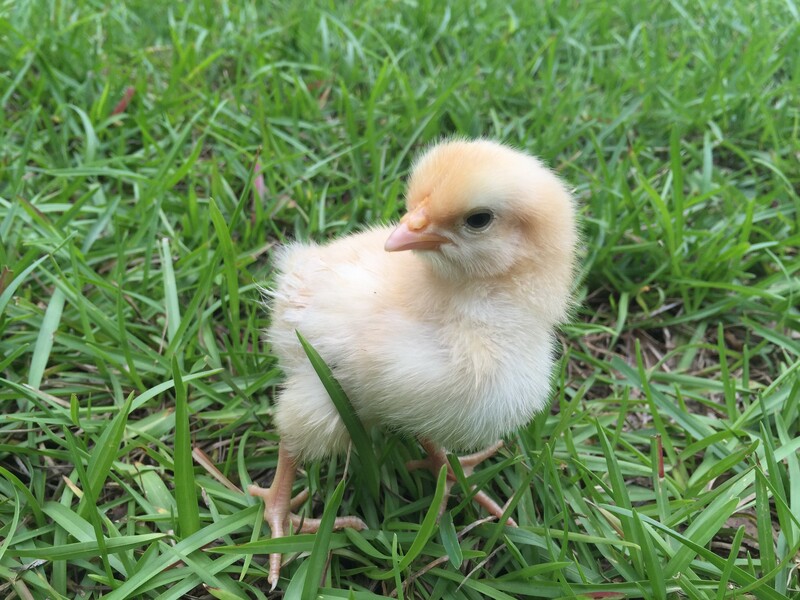 4-H Chick Chain Registration OPEN! 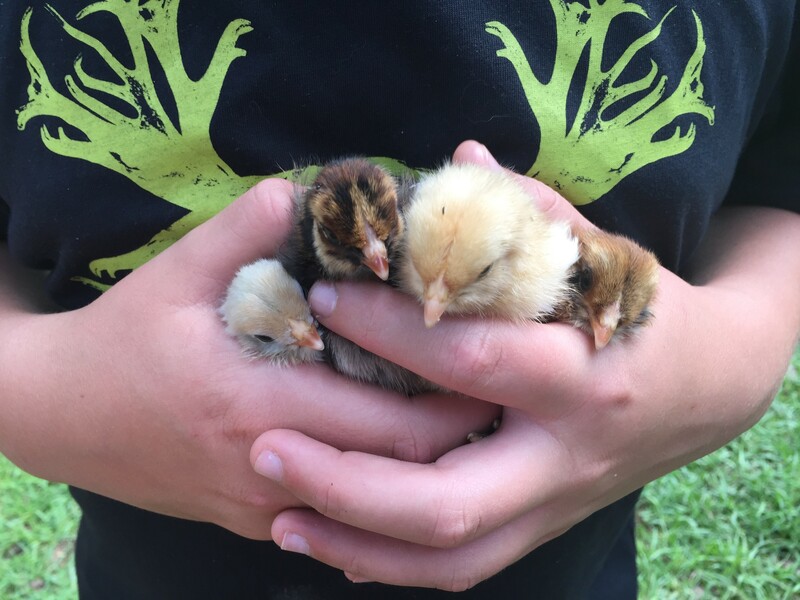 Registration opens today for the 2019 4-H Chick Chain project! This project teaches youth how to raise baby chicks to laying age using science-based best practices. At the end of the project, youth compete in a showmanship and skill-a-thon contest to test their knowledge and also exhibit their birds for judging and awards. HOW DOES THE 4-H CHICK CHAIN PROJECT WORK? Purchase or hatch your own chicks during the month of March. The number you choose to purchase or hatch is up to you, but we recommend that you begin with at least three chicks. 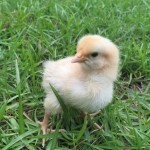 Chicken breeds have unique needs and personalities. Do some research before you choose your breed. There is an orientation webinar and a hands-on workshop to get you ready for the show. Your 4-H Agent or project volunteer can also make a home visit to check up on your progress. 4-H Chick Chain is open to all youth ages 5-18 who are enrolled or enroll as new members in 4-H. Enroll now. Registration opens March 1 and closes March 31 in 4honline. Families can share a project, but each youth should be individually registered. Members who participated in the 2018 4-H Chick Chain project can register as a returning production project. To learn all about the project, read the 2019 4-H Chick Chain Youth Project Guide. If you’re an adult with a love of poultry that you’d like to share with others, consider becoming a 4-H poultry project leader. Our poultry programs include 4-H Embryology in the Classroom, 4-H Chick Chain, and 4-H livestock clubs. Visit http://florida4h.org/volunteers to find out more. To learn more about 4-H in your county, contact your local UF/IFAS Extension Office. Still have questions about 4-H Chick Chain? 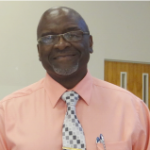 Contact project chair – Julie P. Dillard – juliepd@ufl.edu or call 850.638.6180. Best of Breed winners from the 2018 4-H Chick Chain. Well’s FRM was one of my favorite places to go with my dad when I was a little girl…especially when baby chicks arrived. With spring right around the corner, local feed stores will be getting shipments of baby chicks soon. 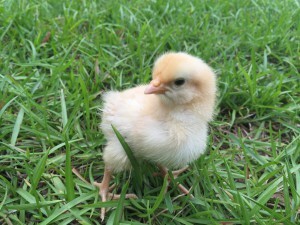 Have you thought about raising baby chicks but are unsure how to? Then join us in the 4-H Chick Chain project! 4-H Chick Chain teaches youth how to raise baby chicks to laying age using science-based best practices. At the end of the project, youth compete in a showmanship and skill-a-thon contest to test their knowledge and also exhibit their birds for judging and awards. You’ll purchase or hatch your own chicks during the month of March 2019. The number you choose to purchase or hatch is up to you, but we recommend that you begin with at least three chicks. The 4-H Chick Chain is designed to take you step-by-step through the process of raising your birds to healthy laying age. There is an orientation webinar and a hands-on workshop to get you ready for the show you’ll attend during the summer. Your 4-H Agent or project volunteer can also make a home visit to check up on your progress. If you’re an adult with a love of poultry that you’d like to share with others, consider becoming a 4-H poultry project leader. Our programs include 4-H Embryology in the Classroom, 4-H Chick Chain, and 4-H livestock clubs. Visit http://florida4h.org/volunteers to find out more. To learn more about 4-H in your county, contact your local UF/IFAS Extension Office. 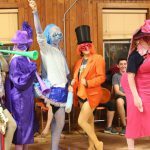 Looking for 4-H Leadership Opportunities? Join us at Third Exec! My very first Executive Board I was terrified! The thought of having to meet new people from across the state of Florida and having to plan an event made my stomach weak. Little did I know that my best friends would come from 4-H Executive Board weekends. I was able to make connections with people I never thought I would ever talk to, and I am so grateful that 4-H is the place where I am able to continue to make lifelong friendships. So don’t miss the chance of a lifetime. 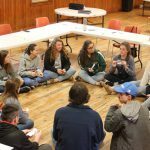 What is the 4-H Executive Board? 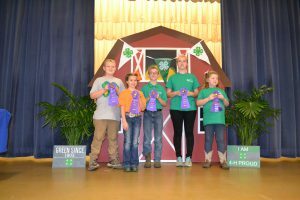 Learn more about 4-H state events at Third Exec. 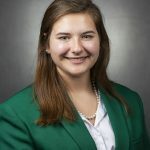 The Florida 4-H State Executive Board consists of four delegates from each of the 13 4-H districts, up to 30 Executive Board Appointees, and the eight Florida 4-H State Officers. The members attend working committee meetings at Executive Board Weekends, where they offer input into our state events. Committee members also play a vital role in the implementation of those events. 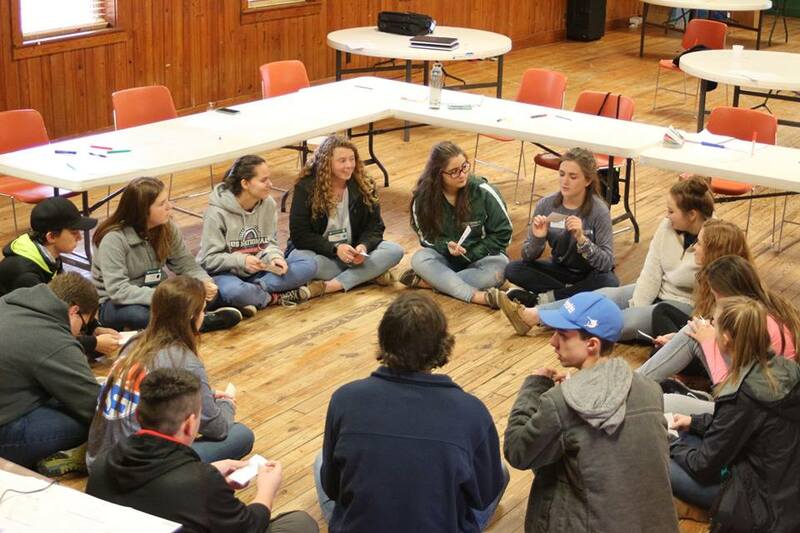 Other committees work on planning and implementing a state-wide community service project, fundraising, parliamentary procedure education, entertainment, and communication/marketing. 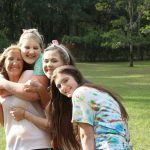 The Florida 4-H State Executive Board invites youth (4-H ages 13-18) to immerse themselves in the planning process behind state events including 4-H University, 4-H Legislature, 4-H Day at The Capital and Intermediate State. 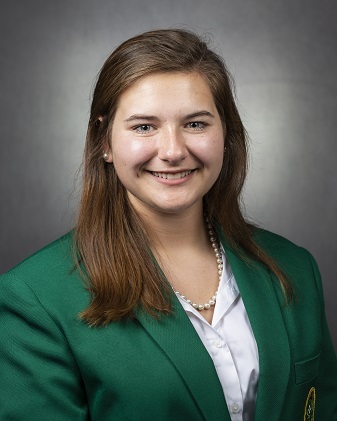 First and Second Executive Board sessions are reserved for those delegates appointees and state officers only, but any 4-H member can attend Third Executive Board. Join us at Third Executive Board! At Third Executive Board, you can expect to learn more about events you may not be familiar with. Throughout the weekend, you’ll also have to opportunity to participate in state-wide service projects, the Ways and Means fundraiser, Parliamentary Procedure contest, camp-wide games, dances, and more. 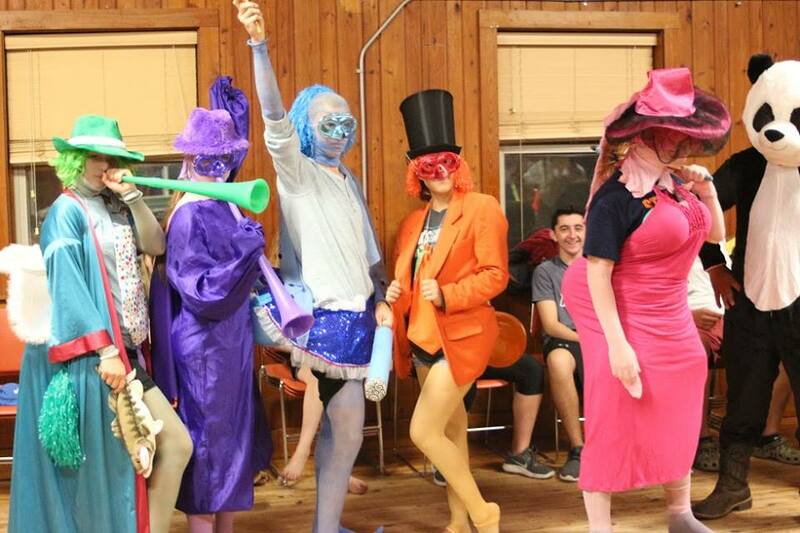 The weekend of Third Executive Board is one like no other! 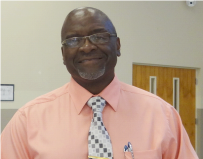 – Jared Heady – 4-H Executive Board Member, Walton County. 4-H friends are the best friends! 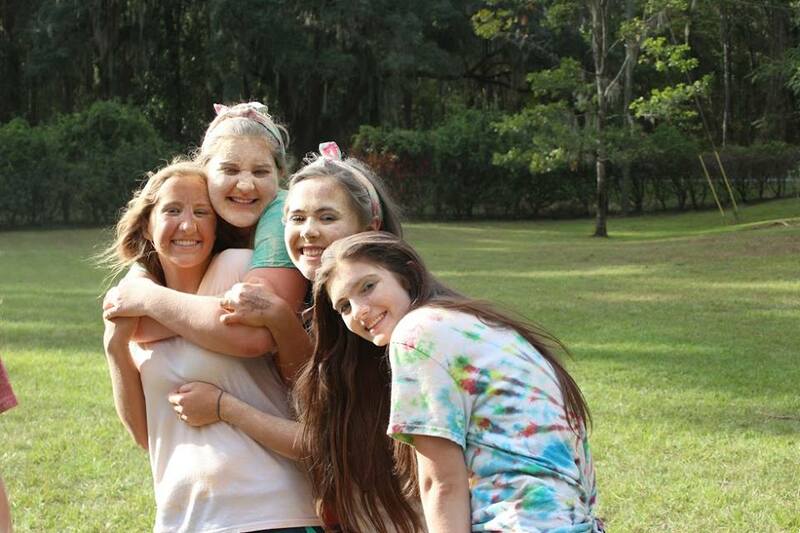 Third Executive Board will be held at 4-H Camp Cherry Lake in Madison, FL, on March 1-3, 2019. The cost for non-Executive Board Members is $120, and $110 for Executive Board Members. Registration for this event opens February 1, 2019 and closes February 22, 2019 in 4honline. I hope to see you at Third Executive Board to make memories that will last a lifetime! Special thanks to Kata for being a guest writer this week! For more information on 4-H in your county, contact your local UF/IFAS Extension office. Can making mozzarella cheese really help you find your future career? As an Extension Agent, I’ve attended numerous 4-H events through the years. Recently, I co-taught workshop at the National Youth Summit on Agri-Science at the National 4-H Center. 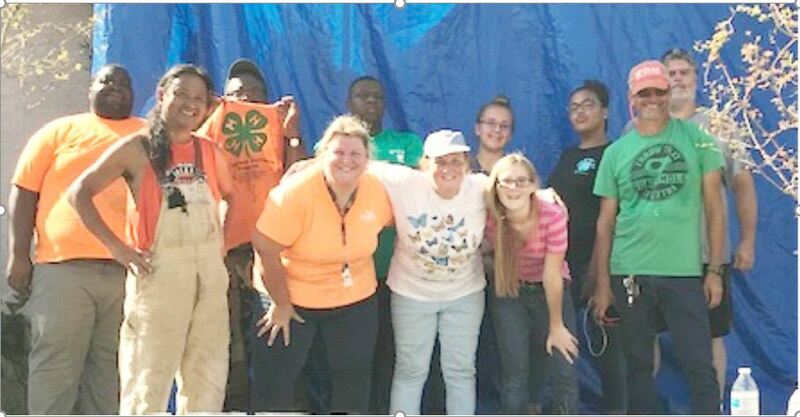 Along with 4-H Dairy & Poultry Science Specialist, Chris Decubellis, FCS Agent, Jill Breslawski, and Dairy Regional Special Agent, Coleen Larson, we instructed 53 teens from 23 states in our two workshops! Careers and Cheese…There’s a Connection! Teens were introduced to agri-science during the keynote address by Mr. Ted McKinney, the Under Secretary of Agriculture for Trade and Foreign Agriculture Affairs. Summit sessions included introductions to career options and agri-science hands-on workshops. The questions and levels of interest were refreshing. I was most impressed with a young lady who expressed hesitation about attending the summit – she thought it would be solely farm-based topics. 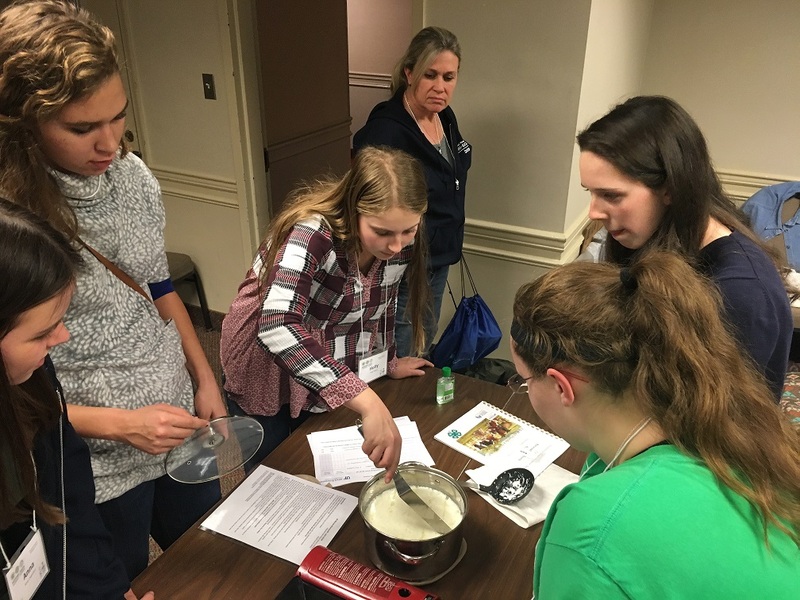 After she participated in our Exploring Dairy Science workshop (incorporating a presentation on a wide variety of careers available in the Dairy Science field and a hands-on activity making mozzarella cheese), she inquired about my career. As we discussed the vast realm of degrees one could hold to work as an Extension Agent and the wide variety of jobs available in Extension, she then shared she had found some direction for her future study in college when she entered as a college freshman in the fall of 2020. Witnessing teens discover fields of study that meet their interests is the best reward! These type of 4-H youth opportunities help teens in so many ways. I encourage all 4-Hers to look past an event title, explore the event opportunities and keep an open mind. It could be a life changing experience! 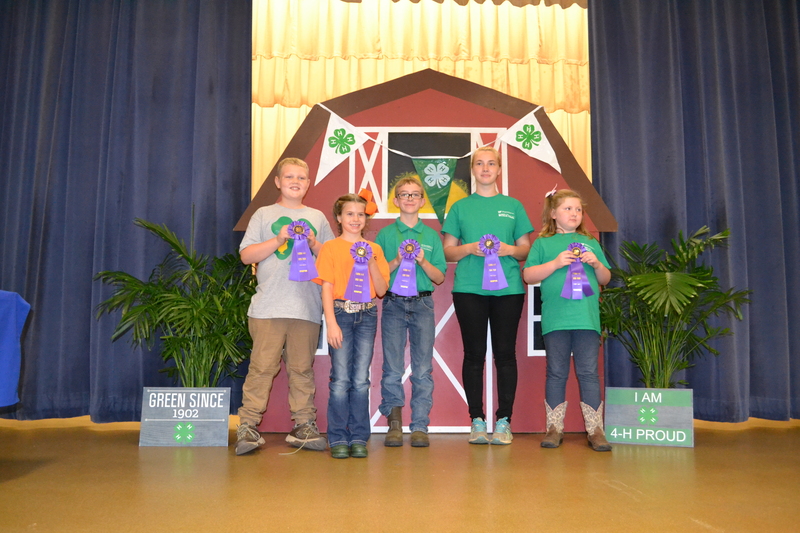 For more information on 4-H in your county as well as state and national level events, contact your local UF/IFAS Extension office. Learn more about the Florida 4-H Dairy project. This article was written by Marie Arick, UF/IFAS Extension Liberty County, County Extension Director & Family/Consumer Sciences Agent. Hands to Larger Service…a perfect description of the amazing teens of the Jefferson County 4-H Teen Council. The hardworking Jefferson County 4-H Teen Council. 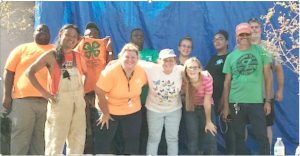 The naturally curious Jefferson 4-H County Council put their best foot forward as they volunteered in Panama City on Saturday, October 20. 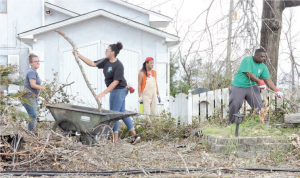 The teens spent the entire day moving and piling tree limbs, garbage, housing debris and miscellaneous items. 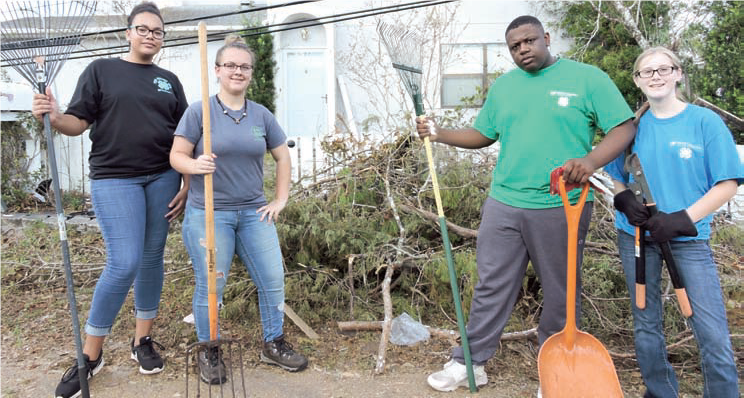 These resilient teens worked around utility workers, fallen power line, utility poles and even worked through the rain. “It was very devastating,” said Sierra. “It was just amazing to witness,” Crandall added. After spending the day in Panama City, Jada Mosley says that the trip home to Jefferson County served as a time to reflect on all they had witnessed in the city. “I was very grateful,” said Jada. 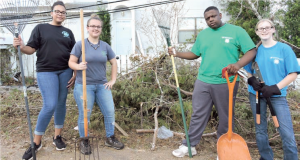 Homeowner and Bay County 4-H Agent with her clean-up crew. 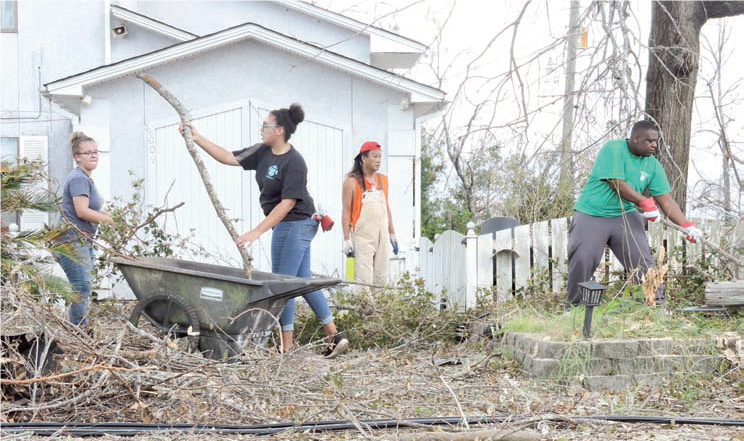 Hurricane Michael was particularly hard on the Extension family because it affected so many of our own – including every member of the UF/IFAS Bay County Extension office. Special thanks to John Lilly, UF/IFAS Jefferson County Extension Director & 4-H Agent for providing this article and pictures.